Below is a map of counties of Ireland . The idea of counties was first introduced to Ireland following the Anglo-Norman invasion in the twelfth century. At that time 12 counties of Ireland were defined in Leinster and Munster. However, improvements in mapping gradually resulted in the counties as we know them today. People largely identify themselves by their native county. 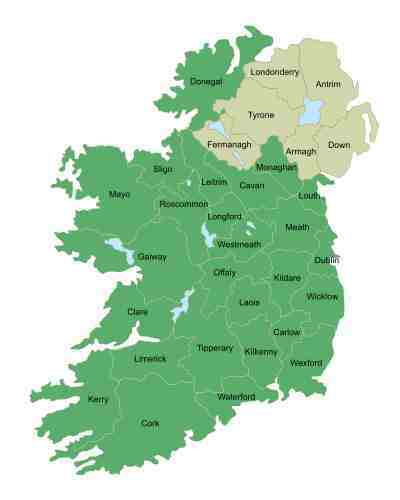 The green areas below shown what is known as the Republic of Ireland. The grey areas are northern Ireland counties that are part of the United Kingdom (UK). In ancient times, Ireland was divided into provinces, each ruled by a King. These provinces were dynamic and their borders changed all the time. Today, when Irish talk about the provinces of Ireland, they mean Leinster, Ulster, Munster and Connaught. The borders of these provinces coincide exactly with the county boundaries. Counties of Ireland in the province of Ulster: Antrim, Armagh, Cavan, Donegal, Down, Fermanagh, Londonderry, Monaghan, Tyrone. The northern part of Ireland offers a different and quite unique experience. If you are planning any trips to Ireland places to visit in Ireland will surely include a trip to these Northern places. The most northern part of Ireland with Ireland landscapes so beautiful including coasts with dramatic cliffs such as the Causeway Coast road in County Antrim. Counties of Ireland in the province of Munster: Clare, Cork, Kerry, Limerick, Tipperary, Waterford. Munster has stunning Ireland landscapes with numerous coastal and harbour towns, such as Kinsale . Munster is also home to Cork City, the second city of the Republic of Ireland. Counties in the province of Leinster: Carlow, Dublin, Kildare, Kilkenny, Laois, Longford, Louth, Meath, Offaly, Westmeath, Wexford, Wicklow. Again contains a rich vein of Ireland landscapes with a mixture of beautiful countryside and modern towns. Oover half the population of the Republic now lives in Leinster. Leinster includes the vibrant capital city of Dublin,full of international atmosphere.